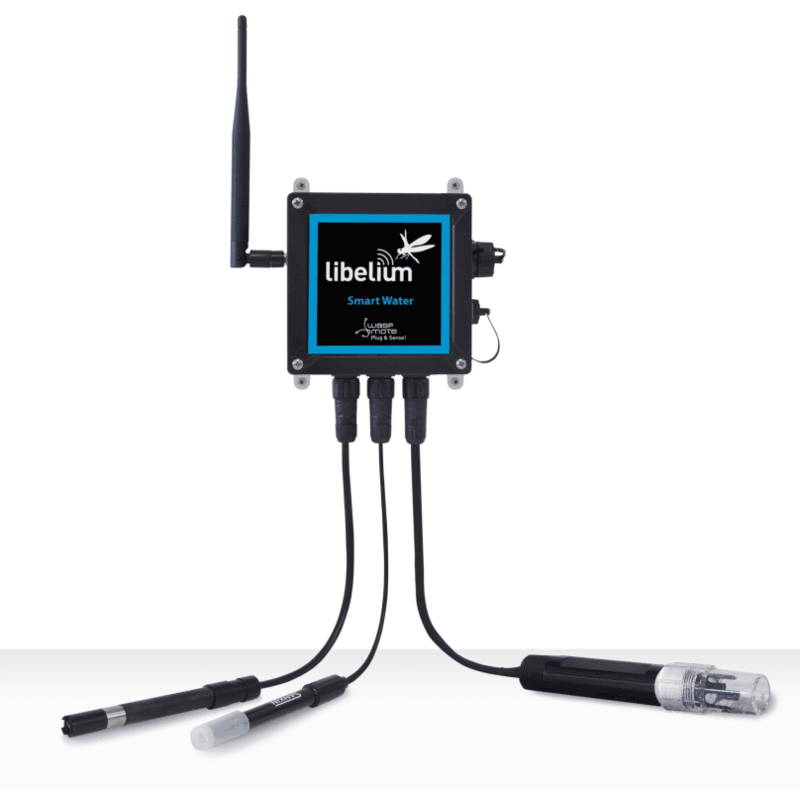 Libelium launched a Smart Water wireless sensor platform to simplify remote water quality monitoring. Equipped with multiple sensors that measure a dozen of the most relevant water quality parameters, Waspmote Smart Water is the first water quality-sensing platform to feature autonomous nodes that connect to the Cloud for real-time water control. Waspmote Smart Water is suitable for potable water monitoring, chemical leakage detection in rivers, remote measurement of swimming pools and spas, and levels of seawater pollution. The water quality parameters measured include pH, dissolved oxygen (DO), oxidation-reduction potential (ORP), conductivity (salinity), turbidity, temperature and dissolved ions (Fluoride (Fluoride (F-), Calcium (Ca2+), Nitrate (NO3-), Chloride (Cl-), Iodide (I-), Cupric (Cu2+), Bromide (Br-), Silver (Ag+), Fluoroborate (BF4-), Ammonia (NH4), Lithium (Li+), Magnesium (Mg2+), Nitrite (NO2-), Perchlorate (ClO4), Potassium (K+), Sodium (Na+). Potable water monitoring: Common chemical parameters include pH, nitrates and dissolved oxygen. Measuring O2 (or DO) is an important gauge of water quality. Changes in dissolved oxygen levels indicate the presence of microorganisms from sewage, urban or agriculture runoff or discharge from factories. A right level of ORP minimizes the presence of microorganisms such as E. coli, Salmonella, Listeria. Levels of Turbidity below 1 NTU indicates the right purity of drinking water. Corrosion and limescale deposits prevention: By controlling the hardness of the water we can avoid the corrosion and limescale deposits in dishwashers and water treatment devices like heaters. Water hardness depends on: pH, temperature, conductivity, and Calcium (Ca+)/ Magnesium (Mg2+) concentrations. Drinking water quality control: Calcium (Ca2+), Iodide (I-), Chloride (Cl-), Nitrate (NO3-), pH. Agriculture water monitoring: Calcium (Ca2+), Nitrate (NO3-), pH. Swimming pools: Bromide (Br), Chloride (Cl-), Fluoride (F-), pH. Waste water treatment: Cupric (Cu2+), Silver/Sulfide (Ag+/S2-), Lead (Pb2+), Fluoroborate (BF4-), pH. 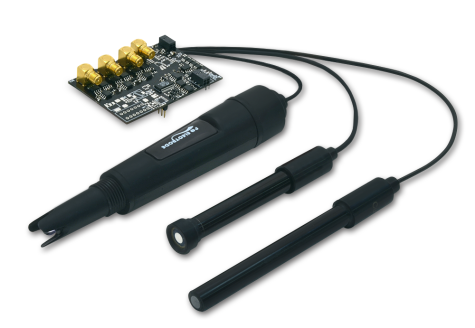 Sensor probes measure more than 12 chemical and physical water quality parameters such as pH, nitrates (NO3), dissolved ions (Fluoride (F-), Calcium (Ca2+), Nitrate (NO3-), Chloride (Cl-), Iodide (I-), Cupric (Cu2+), Bromide (Br-), Silver (Ag+), Fluoroborate (BF4-), Ammonia (NH4), Lithium (Li+), Magnesium (Mg2+), Nitrite (NO2-), Perchlorate (ClO4), Potassium (K+), Sodium (Na+) dissolved oxygen (DO), conductivity (salinity), oxidation-reduction potential (ORP), turbidity, temperature, etc. Pollutants can be detected and treated in real-time, to ensure good water quality over an entire water supply network. Extreme pH values may indicate chemical spills, treatment plant issues, or problems in supply pipes. Low levels of DO may indicate the presence of microorganisms due to urban/agricultural runoff or sewage spills. ORP measures how well water sanitization is working. CE / FCC / IC certification and quad-band cellular connectivity (850/900/1900/2100MHz).Waspmote supports any cellular connection provider, and is ready for deployment in any country in the world. Download the Smart Water Technical Guide. Download the Smart Water Ions Technical Guide. For more information about the Libelium’s new Smart Water Sensors contact our Commercial Team. Read more about the new Ions Sensor Platform for Smart Water here.